Yes, I am still here. I think the lack of Spring like weather lately hit me hard and it was difficult for me to get back into the swing of things at work. Subsequently, I have been coming home so tired, I haven’t felt like much stitching. The little time I have spent stitching has been focused on finishing up a Round Robin and Exchange that needed to get shipped out. 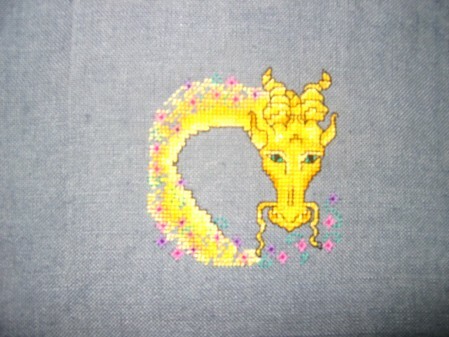 Here is my lovely Spring Dragon all finished and ready to send to Outi. I just wish it were acting like Spring around here. Instead we are getting huge wind gusts, dreary days, cold temps and rain. Only a few degrees colder and we would have had a bunch of snow this past weekend. Okay I had a better pic, but wordpress just doesn’t seem to want to upload the nice one today. Bad wordpress!! Despite all the tragedy at Virginia Tech this week and the stress that has caused at work, I am feeling a little more with it at home. Hopefully that will mean more time stitching and less time wandering aimlessly around the house not quite knowing what to do with myself:) There should be more stitchy posts to come later in the week. Yeah!! It’s looking lovely and I am quite sure it looks far more stunning in per… dragon. What a beautiful springy dragon! Lovely work Leslie! Leslie, awesome dragon! I love it. Who is the designer? Ann. Congrats on getting your dragon posted out – it looks wonderful! That yellow is amazing! Your spring dragon looks great, Leslie! I’m working hard to finish mine, as well. I can’t wait to see Christine’s. 🙂 I hope that you are feeling back to your normal self soon! A very sunny looking dragon Leslie! We need th sun up here too and my fingers are crossed we will finally see some on Friday if not tomorrow. Hope you have it as well. I hope your springy dragon brings us all some spring! He’s pretty…or is it she’s pretty. Love the cheery color! Hi Leslie – the weather sure isn’t any better up here, but yet, today I drove to work in… get this… SUN!!! LOL! I forgot what it looked like! Your dragon is adorable!! She’s so pretty Leslie – lovely spring colors & feeling. Hope your weather improves soon. This is the time of year everyone needs sunshine so badly.